While a ceasefire was announced on Dec. 21 between the Burma government and Ethnic Armed Organizations (EAOs) in Kachin and northern Shan states, civilians continue to become victims of the conflict. 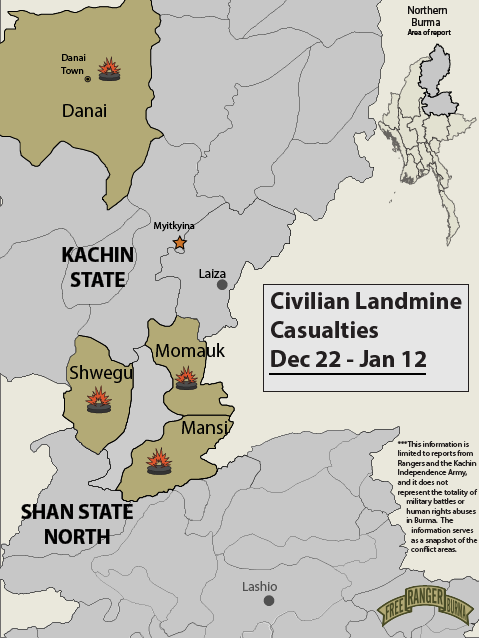 Between 22 December 2018 and 12 January 2019, three civilians were killed and at least three wounded by landmines in Kachin State. Decades of civil war have left Burma littered with landmines which are an ever-present threat for the civilian population as they remain deadly for years after they are placed. On 22 Dec., two men working on a plantation in Mansi Township between Hka Wan Bang and Law Dan villages triggered an old landmine while digging in the ground. 60-year-old Awng La was killed and his co-worker, Hku Nyin, was wounded. In Danai Township on Jan. 7, two villagers from Danai Kinsa Village were going to fish on the Danai River when 32-year-old Mr. Hkun Seng stepped on a landmine. His fishing partner was wounded in the waist while Hkun Seng was injured in the legs. Then, on Jan. 10, a landmine killed Mr. Sai Chyai from Hpake Village in Momauk Township while he was out hunting with another villager. And, on Jan. 12 in Shwegu Township, Mr. Brang Tawng from Kawn Ja Yang Village was out collecting flowers with his two sons when he stepped on a landmine, killing him instantly.